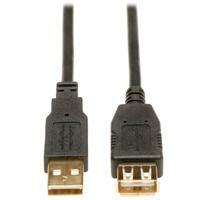 CABLE DE EXTENSION USB TRIPP-LITE U024-006, 2.0 DE ALTA VELOCIDAD (A M/H), 1.83 M [6 PIES],CONECTORES BAÑADOS EN ORO. ESTE CABLE EXTENSIÓN DE ORO DE 1.83 M [6 PIES] ES FABRICADO USANDO CABLE USB2.0. ESTÁ DISEÑADO ESPECÍFICAMENTE PARA USARSE CON CABLES DE DISPOSITIVOS USB 2.0 A/B. ESTE CABLE ES COMPATIBLE CON VERSIONES ANTERIORES Y PUEDE USARSE TAMBIÉN CON LOS CABLES USB 1.1 MÁS ANTIGUOS. HECHO CON BLINDAJE LAMINADO DE CALIDAD SUPERIOR PARA COMUNICACIONES MÁS CONFIABLES Y LIBRES DE ERRORES. LOS CONECTORES BAÑADOS EN ORO Y LOS CONTACTOS DE COBRE BAÑADOS EN ORO PROPORCIONAN UNA CONDUCTIVIDAD SUPERIOR. EL CABLE SE FABRICA CON CONECTORES MOLDEADOS Y LIBERACIÓN DE LA TENSIÓN INTEGRAL PARA OBTENER MAYOR DURABILIDAD Y VIDA ÚTIL.